Walking around JoAnn Fabrics this fall, I found a really cool line of fabrics called Square By Design®. The design that caught my eye was the fish square. Each of the squares has a lovely tapestry-like embroidery, and is very thick. I think they are usually used for upholstery or pillows. The fish one stayed with me, as my husband is an avid angler and has been teaching me how to fly fish. He ties his own flies and fishes at all times of the year. He always has asked me for a quilt, and I never made time to make him one, and I have always felt guilty about that. 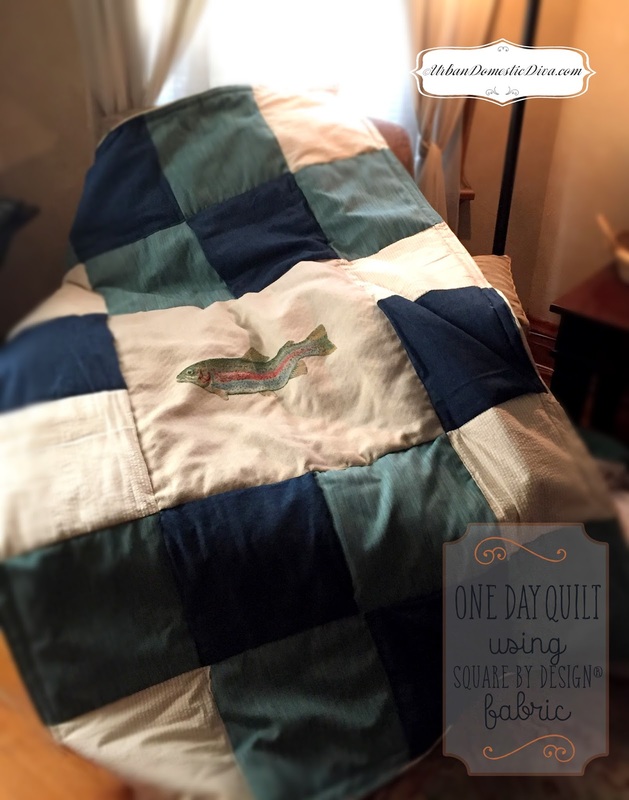 I wondered if I could use the square fish piece at the center of a throw quilt for our "fixer-upper" lakehouse as a christmas gift for him. My one worry was the thickness of the square. What fabric could I match with it to make an evenly stitched and weighted quilt? Quilts are usually a light cotton, making it easy to cut into all sorts of shapes and stitch. A fellow quilter friend suggested denim. That was a perfect suggestion, and denim comes in all shades of blues. At one point I considered upcycling all of the old denim jeans and skirts in my house that were in the donation pile. I ran out of time for that, so resorted to getting new denim from the fabric shop. Denim comes in all kinds of designs, shades, stripes and colors, but I kept it basic. I also found a beautiful, thick fabric that had shades of aqua and blue that matched the fish. It's an upholstery fabric too, but figured this quilt was going to need dry cleaning anyway, so using more upholstery fabric didn't matter. The design is very basic, with just color blocks. Considering the square in the middle measures 24 x 24 (25" assuming a seam allowance), using 1 foot squares (12.5" assuming a seam allowance) made measuring and cutting super simple. Also, most fabric bolts are 50" wide, you are only really needing 1 yard per color-and that gives you a bit of extra if you screw up or want to make some special strips for some edging. I used the aqua color as the main block and flip flopped the cream stripes and the darker denim in between. For the back piece I used a cream denim, 2 yards at 50" wide, one piece covered the whole back with a horizontal cut at the bottom to fit. I cut the pieces using a rotary blade at around 10 a.m, and had it filled and stitched (by machine) by 2 p.m. BOOM. My husband was delighted and surprised! Check out some of the other designs at JoAnn's-see if it inspires you to make a quick little blanket for a loved one. I am eying up the cardinal for my daughter-she loves cardinals. Pieces cut, and pinning front to front. Just keep pinning front to front, following your schematic. All pinned! Now to the machine. Straight stitch blocks together, pulling out pins as you stitch. Keep going until it's all sewn together. You need a bit of an open space to assemble your quilt. Lay your top piece on the floor or a large table, upside down. Then roll out 1-2 layers of quilting fiber fill in an even layer, patted down gently with no air bubbles or wrinkles. Next, lay your quilt back fabric, right side up. Using large safety pins, pin all three layers together in place. I try and use 3-4 pins in a row, then roll the quilt a color block's worth and pin another row. Continue pinning, rolling, pinning, rolling, until all pinned up. Now right under the machine, follow your color blocks along the seam edges, starting about 1 1/2" in from the outer edges to give you room to properly close the sides, horizontal and vertically, through all three layers, sewing it all together. If you want to stitch a more complex design, go for it, but I wanted to keep mine simple and masculine for the hubby. Next go around the outer edge in a giant square, about 1" in. Finally, fold and tuck the outer edges into each other, rolling in any extra fiber fill, creating a clean seam, and sew the edges shut. This is a very basic edging and you will see a seam. You can also do edging strips that hide the stitching, but this takes more time and artistry. Here is a great how to video on binding a quilt properly.